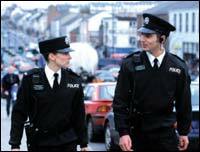 The NI Assembly is to debate a DUP motion urging the government to provide sufficient resources to build a new police training college. The £130m college needs another £40m added to its budget before it can be built on a 210-acre site at Cookstown, County Tyrone. The British government has said it will provide £90m towards the costs. The Policing Board is sending its chairman and vice-chairman to ask the Irish government to contribute. The Irish government has promised to invest several hundred million pounds if the Stormont Assembly is restored. The SDLP has also held a series of meetings with Irish officials and asked for part of that funding to be set aside for the police college. A special debate at Stormont on Tuesday will discuss a motion calling on the British government to provide all of the funding needed to build the new college. Earlier this month, Oversight Commissioner Al Hutchinson urged the government to provide funding for the new office. The 18th report from the office of the commissioner said the government should publish a timetable for completion of the college.